A key part of any project is the project business case. 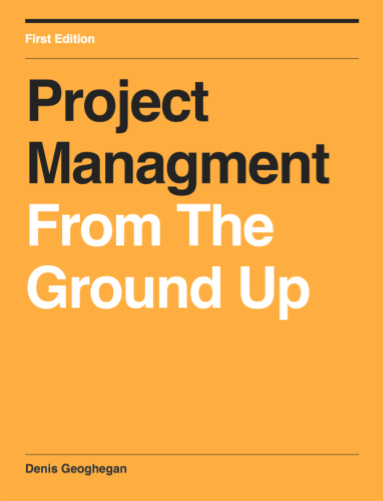 This business case is at the heart of any project and outlines the justification for undertaking the project. Projects require an investment of not just money, but time and effort, thus, the key question a business case must answer is, is this project worth it? In simple terms, the purpose of a business case is to weigh the costs of undertaking the project against the expected benefits of the project once completed. A strategic element: describing the strategic need for the project. Consideration of options: what options were considered before this course of action (undertaking the project) was adopted. Expected benefits and timescales: what benefits will the organization receive once this project is complete and how long will these benefits take to achieve. Costs: what is the project estimated to cost and how will this be funded. Return on Investment: based on the expected benefits and costs, what is the expected return on investment. Risks: what are the risks that could affect the business case. The complexity of the business case will depend on a number of factors. The more complex the organization and the more complex the project, the more complex and thorough you would expect the business case to be, as it needs to delve into significant detail to reassure management that the project is worth undertaking in light of a complex array of facts. For simpler projects and smaller organizations it may not be necessary to create a complicated or even complete business case. Take the case of a small start-up business where they are only ever working on one project at a time. Here, no formal business case may exist, and a project may be undertaken even though there is negative return on investment, because it is moving the organization closer to it’s strategic objective. The point we’re making is that projects are undertaken for all kinds of reasons, and the point of the business case is simply to articulate these reasons. It could be a 200 page thesis, or it could be a single sentence. As long as our project sponsor or a senior member of the business with the right authority is happy to sign off the business case or lack thereof, then we should be ready to proceed. An important point to note is that the business case should be updated over time as new facts come to light as the project is being worked on. For our project business case example we’re going to imagine a growing company that is struggling under the weight of calls to its sales lines. This is resulting in lost sales when calls go unanswered, it also leads to customer dissatisfaction when customers are having to wait a long time for their call to be answered. This means that they are more likely to switch to a competitor in future. This situation is at odds with the company’s strategy which is to always offer the best service. Because of this the company determines that it wants to rectify the situation. Eventually it decides to introduce an automated voice response (IVR) telephone system to ensure that everyone’s call is handled efficiently. The project business case example is show below for this company. As you can see from the example, the figures provided for the costs and benefits aren’t very precise. This is perfectly normal for an early stage project plan, where we’re simply trying to determine the best way forward by estimating the return on investment. Later, as our understanding of the costs and benefits improve we can refine our figures and update the business case. The business case could of course improve, meaning the return increases from our initial estimate, or the business case could deteriorate, meaning the return decreases. If the return on investment decreased to such an extent that it became negative then we’d probably either cancel the project or dramatically change its objectives to keep a positive return. As already mentioned, note that at certain times there will be projects that don’t have a positive return on investment from the outset, such as in a start-up situation. The purpose of a project business case is to provide justification for a project to be undertaken. How this manifests itself will differ from one project to another and from one organization to another, depending on the complexity of each. 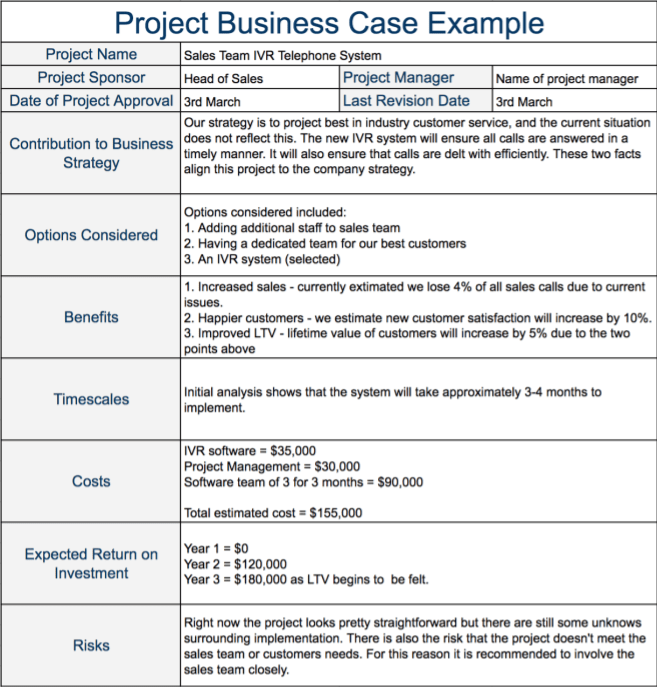 In the project business case example provided above, we’ve attempted to show an early stage business case containing the most common features of a project business case.